Do you know one of the most natural ways to reduce the heart-stopping effects of cholesterol and improve your odds of keeping your heart healthy? Avoiding the leading cause of death and serious illness in the United States may be as simple as improving your dietary intake of one particular nutrient. Many are simply not aware of this nutrient’s importance, but you can naturally optimize your health, prolong your life, and prevent or reduce your exposure to cardiovascular disease through the use of a powerful, but often overlooked, natural supplement – fiber. As many people already know, excess cholesterol can form plaque in your artery walls, making it harder for your heart to circulate blood. Those plaques that break loose in your arteries can block a blood vessel that feeds the brain; this is what causes a stroke. If the plaque breaks loose and blocks a blood vessel that feeds the heart, it causes a heart attack. Fiber can reduce cholesterol, thereby reducing these plaques. Most of the heart health benefits of fiber come from soluble fiber and its role as a binding agent for cholesterol in your diet. Simply put, fiber binds with cholesterol in our diet and prevents its absorption into the body, letting it pass harmlessly through our digestive tract. But that isn’t the end of the story. Your liver produces between 1-2 grams of cholesterol per day. Cholesterol circulates in the blood and is critical for numerous cellular functions including the production of hormones, the building of cell walls, and proper brain function. In addition to what our liver makes, the body also derives cholesterol from our diet – primarily foods from animal sources that contain saturated fat and trans fats such as meat, poultry and fattier dairy products. This is called dietary cholesterol. Soluble fiber binds with dietary cholesterol in the intestines and passes it through the digestive process. This helps reduce the amount of cholesterol which is absorbed into the bloodstream where it can adversely affect heart health. In addition, most people are not aware that the liver not only makes cholesterol but also uses it in the production of bile for the digestive process. Soluble fiber binds to bile, which contains cholesterol, and reduces the body’s ability to reabsorb it. The liver then must pull more circulating cholesterol out of the blood; thereby reducing your overall cholesterol levels. Adding a regular dose of fiber to your diet helps to drive this process. When there is too much cholesterol in your bloodstream, it can lead to adverse health effects. High cholesterol levels over time have been proven to increase your risk of a heart attack through the slow and silent processes of plaque accumulation and the hardening of the arterial walls; this is known as atherosclerosis. A study from The American Journal of Clinical Nutrition confirmed that fiber can reduce cholesterol levels and that boosting fiber intake works well with diet therapy to lower cholesterol and may even be able to take the place of drug therapy in some cases. Fiber, derived from plant sources, is classified as a carbohydrate. However, unlike a carbohydrate such as sugar, it is a substance that the body cannot fully digest. As a result, it passes through the digestive system relatively intact and has little to no caloric value (so it doesn’t hurt your dietary or caloric intake goals). Fiber is generally classified into two groups – insoluble and soluble fiber. Insoluble fiber increases the movement of material through your digestive tract, making it great for constipation relief, weight loss and for supporting intestinal health. It also helps to feed the intestinal microflora that help to digest the food we eat. Sources of insoluble fiber are whole wheat foods, bran, nuts, seeds, and the skin of some fruits and vegetables. Soluble fiber, found in foods such as oats, legumes, apples, bananas, berries, barley, some vegetables, and psyllium, dissolves in water and is what keeps cholesterol from absorbing into the body. Both forms of fiber are important and most sources of fiber give us both kinds. Although we don’t know exactly how it works, study after study tells us that there is a strong link between getting enough fiber and lowering high blood pressure. High blood pressure (hypertension) more easily breaks off pieces of plaque build-up from the arteries, leading to heart attacks and strokes. Fortunately, fiber appears to help greatly. Studies from the Journal of Hypertension and JAMA Internal Medicine demonstrate that fiber can reduce both diastolic and systolic blood pressure; especially in those who are over 40 years old and have higher blood pressure to begin with. A couple of things to keep in mind – one of the studies says to give fiber therapy at least 8 weeks to lower your blood pressure before evaluating its effectiveness, while the other study states that test subjects who took fiber supplements saw better results than those who ate fiber-rich diets because it is generally easier to stick with supplementation than with a diet. Being overweight is a major risk factor for heart disease, often due to the dangers of plaque buildup in the heart’s arteries, and fiber’s ability to provide the body with a low-calorie substance that makes you feel fuller for longer helps prevent overeating and makes it easier to lose weight. There are risks to our heart health simply from carrying too much weight and that these risks are at least partly independent from factors such as high blood pressure and cholesterol. A study published in JAMA Internal Medicine examined people who were either moderately overweight or obese and found that they were all significantly more at risk to develop cardiovascular disease even if they didn’t suffer from cholesterol or blood pressure issues. What makes fiber so helpful is that it helps with both excess weight and cholesterol/blood pressure, helping us address each of the major risk factors for heart disease. Have you had trouble sticking to weight-loss diets in the past? Increasing fiber intake may be the easier way, because a study from Annals of Internal Medicine found that that those who simply ate more fiber lost almost as much weight as those who dieted instead. While the study notes that those who strictly adhere to rather complex diets can lose more weight, it suggests that a simplified approach to weight reduction that focuses only on increased fiber intake may be a reasonable alternative for persons who have trouble adhering to more complicated diet regimens. It is always good to rely on a diversity of sources, both in size and kind, when making health decisions. While all of the studies cited above are from highly-respected, peer-reviewed scientific publications, they are all look at small-to-moderately sized groups of people. Fortunately, Harvard University conducted a study of more than 40,000 health professionals, aged 40 to 75, and came to the same conclusions. The health professionals completed a detailed 131-item dietary questionnaire that measured their usual intake of fiber and which sources they typically get it from. The researchers found a 40 percent lower risk of heart disease among those who had high dietary fiber intake. The results once again show us the inverse association between fiber intake and cardiovascular disease (more fiber leads to less cardiovascular disease). The researchers also claim that the study’s results demonstrate that fiber, independent of fat intake, is one of the most important dietary components of preventing heart problems. Another interesting part of this study to note is that the researchers concluded that cereal fiber, which includes whole wheat bread, brown rice, barley, and seeds, is even better than vegetable or fruit fiber for reducing the risk of heart disease. How Much Fiber Do I Need and How Do I Get It? Even though supplementation is often easier, I always tell my patients that the best way to get any substance you’re looking for (fiber in this case) is to eat a diet rich in whole foods that contain it. Foods such as beans (white, black, kidney and garbanzo), brown rice, almonds, and lentils are all great sources of dietary fiber that can keep your heart healthy. Although most eat at least a couple of those foods, how much do we really have to eat to get all the fiber we need? The national guidelines for fiber tell us that men should aim to eat 30 to 38 grams a day and women between 18 and 50 years old should eat 25 grams a day (21 grams if you are a woman over 50). That may not sound like much, but a 2010 study from the U.S. Department of Agriculture found that most men only eat 18 grams a day and that women average just 15 . This is partly due to some foods that we think are quite fibrous having less fiber than we expect. What do half-cups of broccoli, butternut squash, and celery all have in common? They each contain only a single gram of fiber. If you are like most Americans and just don’t eat enough fibrous foods, or feel like you could benefit from an extra, therapeutic dose of fiber in your diet, I like Herbal Bulk by Seroyal. It gives you a substantial 9 grams of all-natural fiber in just two teaspoons and combines diverse, high-quality sources (such as psyllium, oat, and rice). For those who prefer the convenience of capsules over powder, Fiber Formula by Integrative Therapeutics contains similar ingredients and two capsules is equivalent to 1 gram (or a half cup of broccoli). Fiber-Plex, by Douglas Labs, is also a good capsule option because it includes fiber from a wide variety of natural sources. Many popular, conventional fiber supplements contain more sugar than natural fiber supplements. For example, to get 18 grams of fiber from Metamucil®’s Orange Coarse powder, you also consume 42 grams of sugar – over 160 sugar calories. When compared to the just 2 grams of sugar one consumes when getting the same 18 grams of fiber from Seroyal’s Herbal Bulk, it seems like the Metamucil simply contains more of what you don’t want; that same Metamucil powder also contains artificial flavoring and yellow 6, which most subscribers of natural medicine try to stay away from whenever possible. When you’re doing something that is so good for your body, why add unnecessary and potentially harmful ingredients to the equation? As usual, nature knows best. I hope this information is useful to you, and if you have any questions regarding the concepts discussed here or anything else, you can reach our customer service team at customerservice@oakwaynaturals.com or you can call them at 888-460-3091. 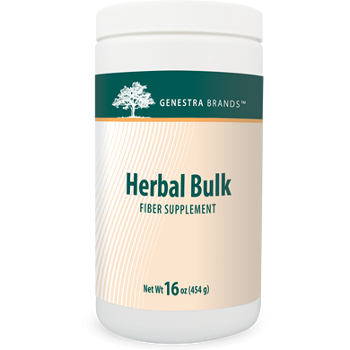 Herbal Bulk provides a substantial 9 grams of all-natural fiber in just two teaspoons and combines diverse, high-quality sources (such as psyllium, oat, and rice). Naturally optimize your health, prolong your life, and prevent or reduce your exposure to cardiovascular disease through the use of a powerful, but often overlooked, natural supplement – fiber. Most of the heart health benefits of fiber come from soluble fiber and its role as a binding agent for cholesterol in your diet. Simply put, fiber binds with cholesterol in our diet and prevents its absorption into the body, letting it pass harmlessly through our digestive tract. Cholesterol circulates in the blood and is critical for numerous cellular functions including the production of hormones, the building of cell walls, and proper neurologic function. In addition to what our liver makes, the body also derives cholesterol from our diet – primarily foods from animal sources that contain saturated fat and trans fats such as meat, poultry and fattier dairy products. This is called dietary cholesterol. Fiber is generally classified into two groups – insoluble and soluble fiber. Insoluble fiber increases the movement of material through your digestive tract, making it great for constipation relief, weight loss and for supporting intestinal health. Sources of insoluble fiber are whole wheat foods, bran, nuts, seeds, and the skin of some fruits and vegetables. Soluble fiber, found in foods such as oats, legumes, apples, bananas, berries, barley, some vegetables, and psyllium, dissolves in water and is what keeps cholesterol from absorbing into the body. Have you had trouble sticking to weight-loss diets in the past? Increasing fiber intake may be the easier way, because a study from Annals of Internal Medicine found that that those who simply ate more fiber lost almost as much weight as those who dieted instead. Fortunately, Harvard University conducted a study of more than 40,000 health professionals, aged 40 to 75. The health professionals completed a detailed 131-item dietary questionnaire that measured their usual intake of fiber and which sources they typically get it from. 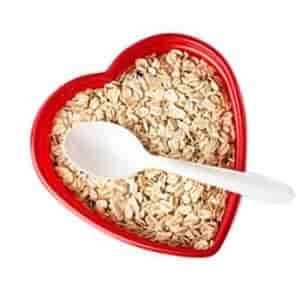 The researchers found a 40 percent lower risk of heart disease among those who had high dietary fiber intake, also the study’s results demonstrate that fiber, is one of the most important dietary components of preventing heart problems. Another interesting part of this study to note is that the researchers concluded that cereal fiber, which includes whole wheat bread, brown rice, barley, and seeds, is even better than vegetable or fruit fiber for reducing the risk of heart disease. I always tell my patients that the best way to get any substance you’re looking for (fiber in this case) is to eat a diet rich in whole foods that contain it. Foods such as beans, brown rice, almonds, and lentils are all great sources of dietary fiber that can keep your heart healthy. National guidelines for fiber tell us that men should aim to eat 30 to 38 grams a day and women between 18 and 50 years old should eat 25 grams a day (21 grams if you are a woman over 50). Most men only eat 18 grams a day and that women average just 15 . This is partly due to some foods that we think are quite fibrous having less fiber than we expect. What do half-cups of broccoli, butternut squash, and celery all have in common? They each contain only a single gram of fiber. If you are like most Americans and just don’t eat enough fibrous foods, or feel like you could benefit from an extra, therapeutic dose of fiber in your diet, I like Herbal Bulk by Seroyal. For those who prefer the convenience of capsules over powder, Fiber Formula contains similar ingredients and two capsules is equivalent to 1 gram (or a half cup of broccoli). Fiber-Plex, by Douglas Labs, is also a good capsule option because it includes fiber from a wide variety of natural sources. Many popular, conventional fiber supplements contain more sugar than natural fiber supplements. For example, to get 18 grams of fiber from Metamucil®’s Orange Coarse powder, you also consume 42 grams of sugar – over 160 sugar calories. When compared to the just 2 grams of sugar one consumes when getting the same 18 grams of fiber from Seroyal’s Herbal Bulk, it seems like the Metamucil® simply contains more of what you don’t want. That same Metamucil powder also contains artificial flavoring and yellow 6, which most subscribers of natural medicine try to stay away from whenever possible.